Despite an inept performance, evo relentlessly wants to remain in power, NO matter what! 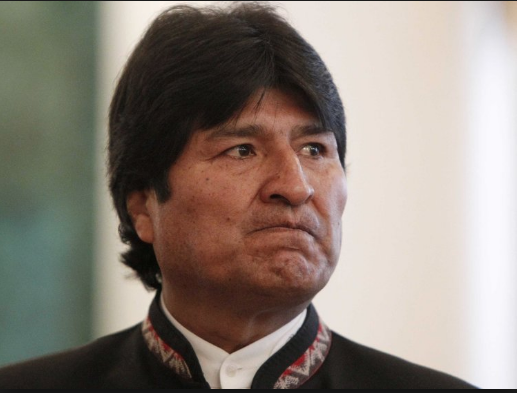 Evo Morales is demonstrating that he is insatiable to hold power, despite the fact that in the 12 years he has exercised it, he did not personally do something that could justify him as a good administrator of public interests. Had he carried out a job that demands capacity and effort, with so much time of being invested with that responsibility, the natural thing would be that it is more than enough to be exhausted with the work he had to have accomplished. Morales was elected with a high vote in 2005, in his term of office two important constitutional reforms were made. The first, each government administration became four or five years and the second, you could access a single re-election. For more precision, article 168 of the current Constitution, promulgated on February 7, 2009, provides: “The period of office of the President and Vice President is five years, and they may be reelected once only on a continuous basis”. Morales trying another re-election in 2019 would be demonstrating that he is insatiable to dispose of the State, without demonstrating, however, any justification for it. Then, it is nothing more than an excessive ambition for power. Worse yet, by attacking what the Constitution foresees, which is the product of its own management. It has incurred a grievance to Bolivians in general by declaring to the press that “if the people want, we will continue”. What people are you talking about? Where has it been that “the people” are demanding that they continue as rulers? It would have to sign many books to be like this, which would show that indeed “the people” are asking for it. If this does not happen, Morales is simply and outwardly showing his will and nothing else. The only demonstration in favor of this occurred in the small town of Ivirgarzama, in Cochabamba, a place he frequents, because of the neighborhood he has with the coca-growing area of Chapare, where Morales emerged as his leader, which implies that he was one more of them. Governing the country is not like integrating or directing a coca growers’ group, the territory is spread over hundreds of towns and not a few. The power, in the case at hand, is born of drug trafficking, because the coca that is produced in the country is the origin of such illicit activity. Nowadays, coca is less and less chewed, although, in particular, the drivers, who travel long distances, are forced to do so. They do this to physically resist the demanding work they do and, especially, not to fall asleep while driving, because the chewing of the coca keeps them awake and active, because it generates them some energy. This would be basically the main reason for work that induces coca chewing. Before it was done by the peasants of the valleys and the altiplano, but at present they do not appeal to it in a constant way, because they have more and more tractors. Before they had to do to perform agricultural crops and crops, which required physical strength, which is what generates coca in its proper use. In contrast, the drug offered by drug trafficking hurts human health and encourages illicit commercial activity. This entry was posted in Bolivia, Drug war - narcotraffick, Politics, Social Unrest and tagged cocaine production, corruption in public office, demagogue, democracy in peril, government failures, narcotraffick, Ochlocracy. Bookmark the permalink.